To begin the print process, go to the File menu and select PRINT. This dialog will appear. 1) Set Color Handing to "Photoshop Elements Manages Color." 2) Select the printer profile - The profile should have the name of your paper and printer. 3) Rendering Intent - Choose Relative Colorimetric or Perceptual. We recommend Relative Colorimetric for most images. 4) Click the Printer Preferences button - this will launch your printer's preference dialog. In this next section, you'll set your printer drivers to use the printer profile you just chose in the above menu. This includes choosing a media type, print quality, paper, size, and turning off color management. What brand printer do you have? Click the "show instructions link to proceed". Epson printer properties have slight variation from model to model but the concept is the same. 1) Choose the Media Type recommended by the profile's instructions. You will only see Epson paper names in this box. Choose the setting based on the profile's instructions. 2) Set quality to level recommended by profile's instructions. 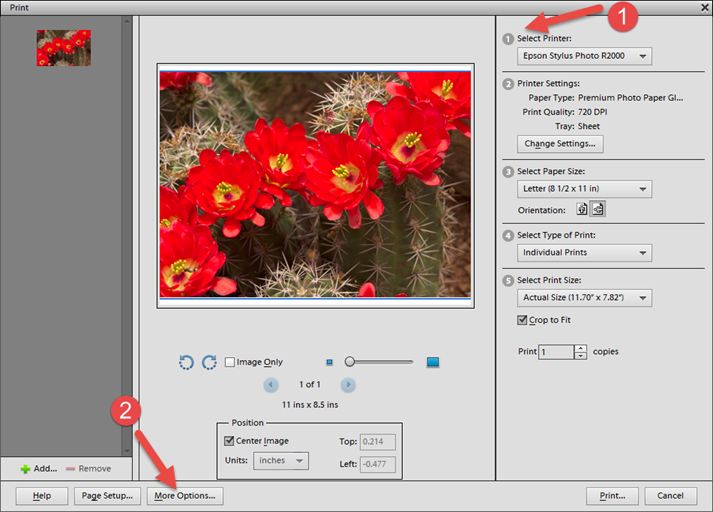 3) Set color management to Off (No Color Adjustment). 4) Pick your paper size. Once you verify the settings you can click OK. Choose the Media Type recommended by the profile's instructions. You will only see Canon paper names in this box. Choose the setting based on the profile's instructions. We recommend the highest print quality for most print jobs on your Canon printer. Under Color / Intensity click the Manual radio button and click Set . The Manual Color Adjustment dialog appears. Click None under the Color Correction menu. On the FEATURES TAB choose the Paper Type (Media Type) recommended by the profile's instructions. You will only see HP paper names in this box. Choose the setting based on the profile's instructions. 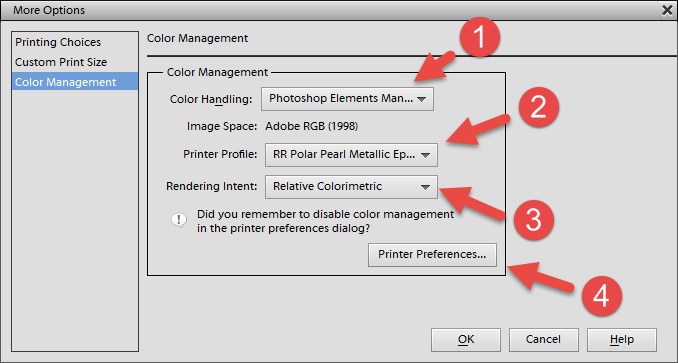 On the COLOR TAB choose Application Managed Colors at the Color Management drop down menu. Once you click OK on the printer properties dialogs above, you will click OK until you are back at the main Photoshop Elements print dialog. 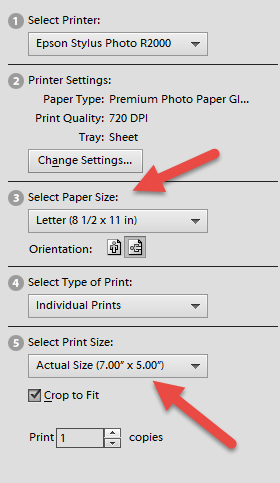 Verify that your paper size matches the size you set in the printer properties. Verify that you have Select Print Size set to "Actual Size". You can now click print, confident you'll have a great looking color managed inkjet print.